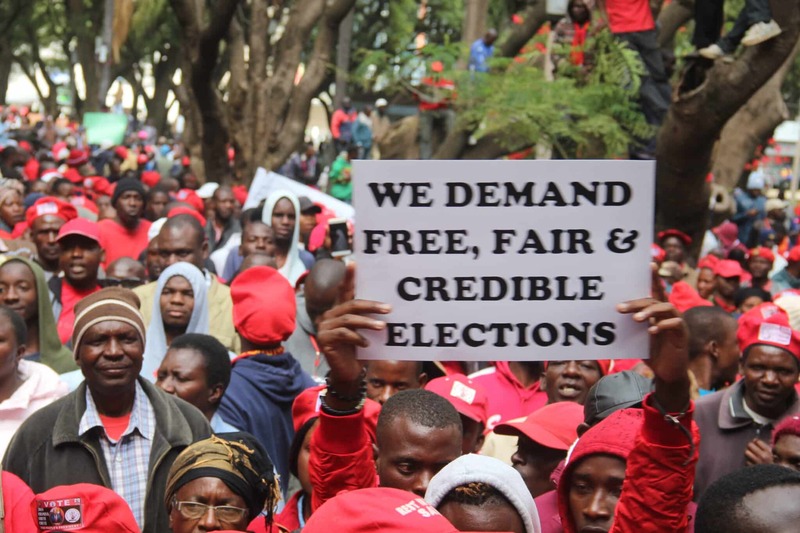 The MDC Alliance has promised to be peaceful when they take to the street to protests against the Zimbabwe Electoral Commission (ZEC) which they accuse of failing to administer a free and fair election. The MDC Alliance, a consortium of seven political parties gunning to dislodge the ruling Zanu PF from power, have threatened to camp outside the ZEC offices in Harare to push for the implementation of key electoral reforms as well as transparency in the printing and distribution of ballot papers. Speaking at a Joint Youth Liaison Committee (JYLC) comprising of youths from various political parties, MDC-T Youth Assembly Secretary General, Lovemore Chinoputsa said his party is committed to see a violent free election but argued that it all rests on the conduct of ZEC in the remaining seven days to the election day. “ZEC owes this country a peaceful election and environment because as political leaders across the political divide, we have done our part and it now rests with ZEC to make sure that they do their part in ensuring that the country holds a very peaceful election,” said Chinoputsa. “We have made it clear that this election has to be fair, free and credible and it should be conducted in a manner that does not bring illegitimacy to whoever wins. We have been asking ZEC to make sure that they bring some sanity in the manner in which this election will be conducted. “Our push, starting from tomorrow, is to make that as Zimbabweans we will not be hoodwinked into an election that is not fair and credible. We will continue to put pressure on ZEC till our demands are met,” said the youthful leader. However, posting on his Twitter account, MDC Alliance Treasurer General Charlton Hwende threatened to fight and die till their demands are met. “We are pressing ahead with our preparations for the night vigils and demonstrations this week. We want a free and fair election. We are prepared to die just like the thousands of our brothers and sisters who died defending one man one vote during the war of liberation,” said Hwende. Chinoputsa, however, quashed reports of violence saying the opposition movement stands for peace. “We are not threatening any form of violence. The MDC has always been a non-violent party, our view is that if we had wanted, we would have taken arms a long time ago when we started this movement. We will never get violent because we do not believe issues can be solved that way,” said Chinoputsa. He noted that this election is a do or die for the people of Zimbabwe and reiterated that the opposition movement will not stop until they are heard.